Watch Keep: New River Fellowship Church pastor Scott Crenshaw removed as lead pastor for "inappropriate images"
New River Fellowship Church pastor Scott Crenshaw removed as lead pastor for "inappropriate images"
I reported my concerns about New River Fellowship Church and the removal of Scott Crenshaw to the NCMEC Cybertipline. I have spoken with Detective Rick Reese in the Hudson Oaks Police Department. If anyone has further information about Scott Crenshaw's removal due to "inappropriate images," or any information that needs to be reported to law enforcement, please contact Detective Rick Reese at 682-229-2424. A senior pastor in the Fort Worth area has been removed from his job because he had “inappropriate images” on his work computer, according to the church. The board of directors of New River Fellowship Church announced earlier this week that it removed senior pastor Scott Crenshaw from his position. Crenshaw helped started the contemporary church, which is based in Hudson Oaks and has campuses in Benbrook and Minerals Wells. The church has more than 2,000 members. Scott has made some unfortunate choices that have caused us much concern. Leadership confronted him and discussed at length the concern, the nature of which was related to inappropriate images on his church office computer. The Board then confronted Scott and went through the steps of dealing with sin as outlined in Matthew 18. Because Scott chose not to properly address this issue, he is not qualified to lead as outlined in 1 Timothy 3 and the church bylaws. We spent hours with Scott praying diligently about seeking outside counseling, to which he has agreed. It is our desire to see complete restoration for him and hopefully return as our Senior Pastor; however, that is the Lord’s call not ours. It is important we provide private space for Scott and his family as part of the healing process. You will not see Pastor Scott and Renee at church and will not see much of them on social media. Please understand, their marriage is strong and Renee is walking at Scott’s side through all of this. We know you will want more details but we ask you to please refrain from reaching out to them to satisfy your curiosity. Every board member you see is available to ask questions, but please do not be offended if some answers we choose not to give. For complete healing for Scott and his family we want to honor the man and woman of God they are, and not give into gossip. We have been honored to sit under the teaching of a man who proclaimed the gospel with words that reached a diverse body. Many of you have experienced the power of God in this house through Freedom Ministry. Please understand that as Scott “submits to this process” many will become free because of his submission. Leadership starts in the house of God. It is our hope that every member of this church body will commit to prayer. Please do not allow the enemy to get his foothold through gossip, arrogance or judgment. Instead allow this to be a reminder that the secret things come to the light in all of us. Recognize the fear of the Lord and create an atmosphere of transparency. It is in confession to one another that we receive healing. None of us is without sin but as long as we keep things in the dark we are bound. Did any of the "inappropriate images" found on pastor Scott Crenshaw's church computer contain minors? If so, has the leadership of New River Fellowship Church reported this to police? This question seems to fall into the category of answers New River leaders "choose not to give." First of all, as people want to talk to you about details, send them to newriver.tv. The written statements of the board, Scott, and myself will be there along with some great scripture reminders for people to have and to read in black and white. Let them talk about that. Next, if you have questions… Each Monday night at HO and MW, and each Wednesday night at BB we gather for our EQUIP NIGHTS. The Campus Pastors of each campus will be in the lobby each EQUIP NIGHT for the rest of the year to visit with any of you who have questions or need counsel about this, and as always you can call the church office to make an appointment to visit with any of our Pastors. Earlier today, I tagged New River pastor Jeff Humphrey on Twitter and asked my question about the images found on Crenshaw's computer. 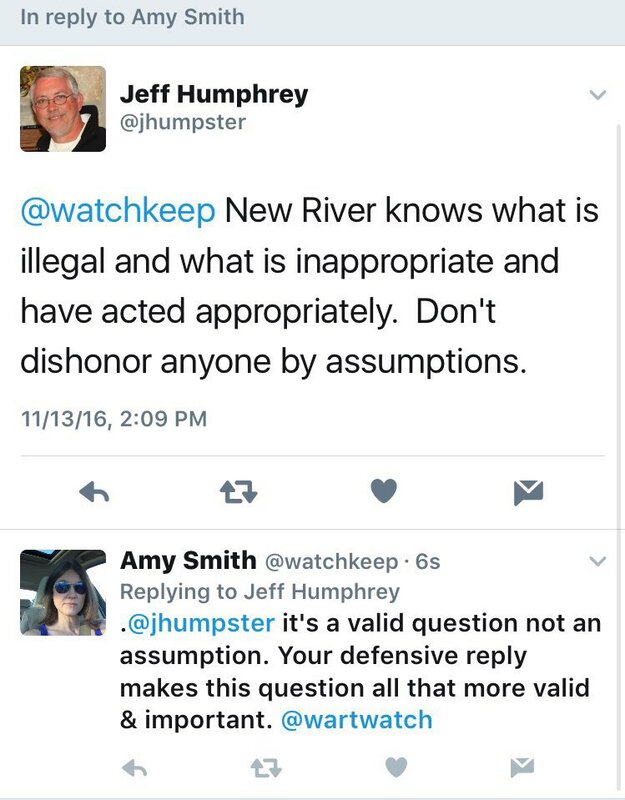 As of 5:30 pm, Jeff Humphrey has protected his Twitter account which was previously public. The light of truth and knowledge is our greatest tool to protect kids and vulnerable adults. If anyone has information that children are being exploited through child sexual abuse and images of child sexual abuse, please call police immediately or call NCMEC Cybertipline or use the online form to make a report. What a weird letter they sent out, recommending transparency and forbidding people to speak of the matter at the same time. ! The beginning of the letter sounded like a form letter. The wording works for PN, too. The end is hypocritical. We are available to talk and don't ask anything is how I read this... Do PN and DB have any relation with this man does anyone know? Lesson for today: do not criticize a Conservative no matter how corrupt and immoral and sinful they are. If they praise with their lips its ok their hearts are far. Todays Pharisees wear suits & have $10's millions and look into the camera to tell us the truth. They learn quickly. Mouth the words religious folk will respond to: Family values. Pro life. Defence of Marriage. Hetrosexual divorce at 50% is the real threat to marriage. Closet gays railing against gays! Amy Smiths blog reports sexual predator Pastors. Theres alot. Fox news defending christmas!!! As if God is ok with lying to children about a cartoon character that knows if they're good or bad. And talking snowmen and flying reindeer. Presents, lights, cookies, food, alcohol. Deluded western parents stand in long lines to have their new born children photographed on the knee of a cartoon character. The lies begin early. But theres a WAR against christmas!!! !